: Mechanical separation of solid contaminants from oil systems (fuel and lubricating) is achieved by the use of filters and strainers. A strainer is usually a coarse filter to remove the larger contaminating particles. Both are arranged as full flow units, usually mounted in pairs (duplex) with one as a standby. The strainer usually employs a mesh screen, an assembly of closely packed metal plates or wire coils which effectively block all but the smallest particles. It is usually fitted on the suction side of a pump and must be cleaned regularly or when the pressure differential across it become unacceptable. Where suction conditions are critical the strainer will be fitted on the discharge side of the pump. When cleaning is undertaken the other unit will be connected into the system by changeover valves or levers and oil circulation will continue. The particles of dirt collect on the outside of the strainer element or basket and can be removed by compressed air or brushing. A strainer should be cleaned as soon as it is taken out of the system, then reassembled and left ready for use. Magnetic strainers are often used in lubricating oil systems, where a large permanent magnet collects any ferrous particles which are circulating in the system. The magnet is surrounded by a cage or basket to simplify cleaning. Fine filters, again in pairs, are used to remove the smallest particles of dirt from oil before the oil enters the finely machined engine parts in either the fuel injection system or the bearings of the rotating machinery. Fine filters are full-flow units which clean all the oil supplied to the engine. The filtering substance may be a natural or synthetic fibrous woollen felt or paper. A steel division plate divides the steel pressure vessel into an upper and a lower chamber. 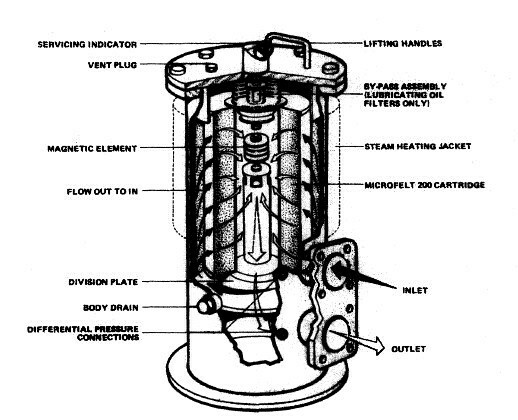 Dirty oil passes into the upper chamber and through the filter element, then the filtered oil passes down the central tube to the lower chamber and out of the unit. A magnetic filter can be positioned as shown in the central tube. A spring-loaded bypass is shown in the diagram, for lubricating oil filters only, to ensure a flow of oil should the filter become blocked. The cartridge in the design shown is disposable although designs exist to enable back-flushing with compressed air to clean the filter element as required. 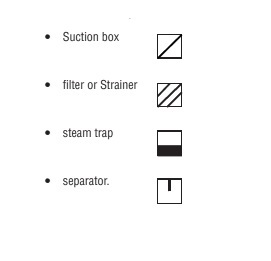 The filter unit shown will be one of a pair which can be alternately in service. In full-flow filtration systems all the oil passes through the filter on its way to the engine. In a by-pass system most of the oil goes to the lubrication system and a part is by-passed to a filter. A higher pressure drop across the filter can then be used and a slower filtration rate. A centrifugal filter can be used in a by-pass system where the oil passes through a rotor and spins it at high speed . Dirt particles in the oil are then deposited on the walls of the rotor and the clean oil returns to the sump. This type of filter cannot block or clog and requires no replaceable elements. It must be dismantled for cleaning of the rotor unit at regular intervals. Two centrifuges are fitted to a diesel engine fuel system in series because the first one is used as a purifier that removes water and sludge from the fuel oil and the second centrifuge is used as a clarifier, which removes solids from the fuel oil.